Heron Corn Mill in Beetham is a Grade ll listed building situated on the banks of the River Bela and is one of the few working mills left in Cumbria. In 2009 the site installed a hydropower turbine in the weir to generate electricity which is then sold to the paper mill opposite. The re-developed barn is used as an educational and arts resource and a building for community hire. A year-round programme of events and activities are offered and in 2017, the Westmorland Arts Trust awarded £1,000 towards an arts project called ‘Beautiful End’. The project was a creative response to the novel of the same title by Westmorland writer Constance Holme who lived and wrote from Milnthorpe and Arnside. The novel, written in 1918, is also a one-act play called ‘The Home of Vision’, and concerns the life and care of an elderly tenant farmer by his living relatives set in the Dallam Estates farmland close to Heron Corn Mill. It provokes and challenges assumptions about old age, home and identity. 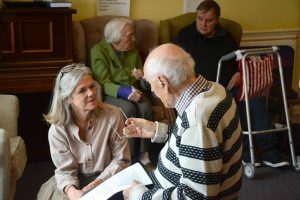 Theatre-maker Carran Waterfield, violinist Carolyn Francis and bassoonist Luke Crookes delivered workshops at a local residential and day school supporting children and young people with complex needs and at a local care home working with older residents with dementia to explore what home means to them. A weekend of performance, readings and talks with a photographic exhibition will be held on Saturday 26th May. This will take the form of improvised work along with a talk from the artists on how the project has progressed and how this can be developed going forward. Audrey Steeley, Creative Projects Manager at the mill, said: “Older people with dementia opened up to our work, and one resident told us a story of his days as a boy scout. 70 years later he still has his uniform as it means so much to him.